ENCINITAS — Sue Miller moved to Cardiff-by-the-Sea six years ago, attracted by the tantalizingly short jaunt to the beach: five minutes, across a flat plain covered by blue chalk sticks, coastal sage and railroad tracks. She soon found out that the short trip was technically illegal. Miller represents the middle of the road of Cardiff, where a proposed walking and biking path approved in May that would run parallel to the tracks and trigger the installation of a fence along the entire stretch of Cardiff coastal plain has polarized the scenic coastal community. Both sides have taken to the Internet to stake their positions. On one side there are the opponents, which launched the website “NoRailTrail.com” two weeks ago. The site allows people to send form letters to more than a dozen elected officials, public employees and others associated with the Coastal Rail Trail project. Opponents argue that the convenience of shaving time off their walk to the beach — the closest legal crossings are a mile in either direction — far outweighs the risk of getting caught by police who historically have infrequently enforced the track-crossing rule, or getting hit by an oncoming train. Call it Cardiff’s time-honored tradition of civil disobedience, they said. The fence, opponents of the plan say, symbolically and effectively divides Cardiff from the ocean that has attracted many of its residents. “The fence will split our community in two,” Alkhas said. Verdu said that the proposed San Elijo trail route would complement the flurry of projects in the works for the area, including the proposed double-rail tracking through Encinitas, the improvements at the Chesterfield Drive intersection with Coast Highway 101 and the tracks and a proposed rail crossing at Montgomery Avenue. The alternative — improving Coast Highway’s pedestrian and bicycle paths — isn’t nearly as compatible, Verdu said. One of the chief assertions the supporters are attempting to debunk is that the trail project alone would lead to the installation of the fence. According to North County Transit District, which owns the rail and adjacent right-of-way, it has been the plan for years to fence off the rail line, but they have only been able to complete sections of fencing for various reasons, namely funding and cooperation with communities along the right of way. But NCTD officials said the district’s policy that require fencing as a component of all major capital projects — such as the rail trail or double track — will mean that Encinitas will get fencing sooner than other segments of the rail corridor. Additionally, NCTD officials say most importantly, Encinitas’ reputation of illegal crossings has put it in the crosshairs sooner than it would have otherwise. 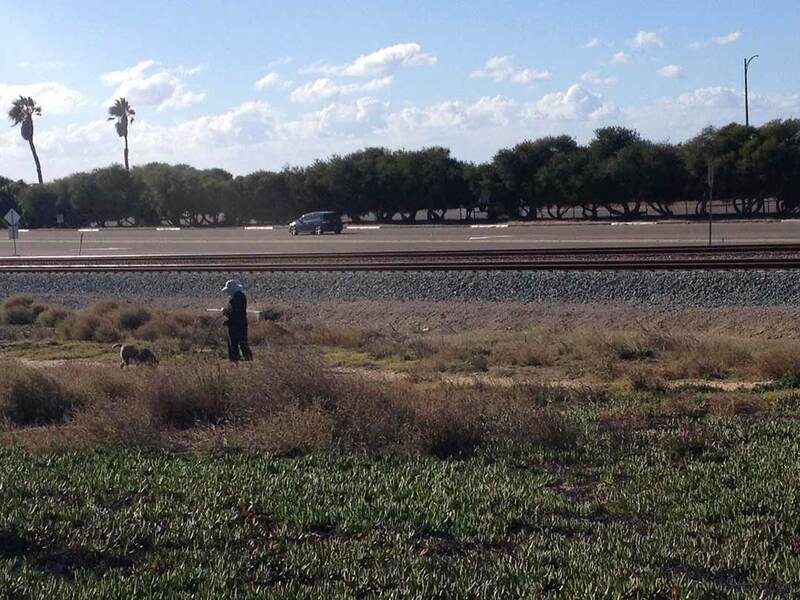 Trains have struck people 12 times along Encinitas rails since 2012, 10 of which resulted in fatalities. Additionally, there have been 87 reported near misses during the same period, most of which involved pedestrians on the right of way. Miller, walking along the dirt path in Cardiff, said she understood both sides of the debate, but ultimately looks forward to the new trail.